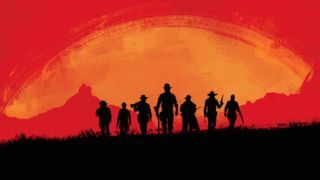 Let's tread carefully here but it looks like reddeadonline.com currently redirects to Rockstar's website, specifically the news post with that art up there. On top of that, these tweets seem to have uncovered the address as registered to Take Two, Rockstar's parent company. Now neither of these are conclusive proof, but it wouldn't be a huge surprise to see Rockstar favour an online model for a Red Dead sequel - GTA Online has been hugely, hugely, lucrative for the studio, making in excess of $500 million. You can almost certainly forget about that GTA 5 single player DLC happening anytime soon. Chances are we'll find out more today. The logo on arrived on Sunday and that art yesterday. Daily drops seem to be the pattern here. There's a wisp of a rumour that a trailer might arrive on Thursday, so this could all be building up to that. We'll keep you updated.